Owning a MacBook Pro (2016) has been a very fun experience. While some people are unhappy not having USB Type-A ports, I am happily embracing the Type-C/Thunderbolt 3 ports. Sure, I have needed a dongle a few times when connecting some devices, but it hasn't been too bad. I've even embraced a USB-C dock (with power delivery) to create a Mac desktop experience in my home -- mouse, keyboard, and monitor. So far, however, I haven't been very satisfied with USB-C docks. I sometimes face issues where USB ports don't work while delivering power. On a few occasions, my connected USB hard drives have disconnected when the Mac goes to sleep, leading to macOS warning messages. The market will soon be saturated with true Thunderbolt 3 docks that should provide a much better experience. Today, StarTech announces a new line of Thunderbolt 3 devices, including docks and display adapters. If you aren't familiar with StarTech.com, please know that it is a very reputable and dependable company. I have been buying and using its products for years. StarTech manufacturers many cables, dongles, and adapters that can be hard to find. If you do a search on Amazon, you will see many positive reviews for its offerings. "The first dock (SKU: TB3DKDPMAW) is a model that provides dual-4K video output and ports for connecting additional devices. 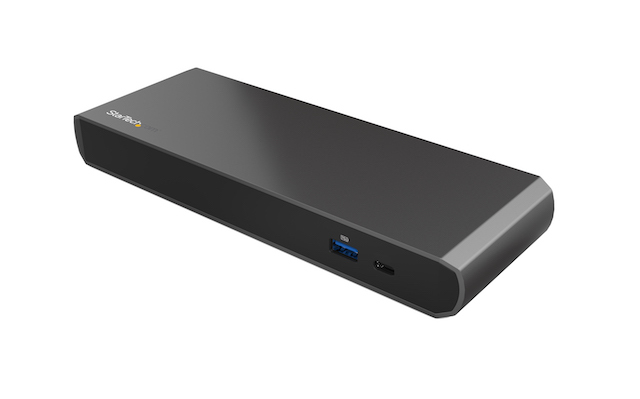 An alternate version of the dual-4K dock (SKU: TB3DK2DPPD), offers power delivery for powering and charging a MacBook Pro and Thunderbolt 3 enabled laptops. For the more advanced user and to meet the demands of future laptops, an enhanced dock (SKU: TB3DOCK2DPPD) will be available, offering more ports and power for charging," says StarTech. The company also says, "For the user who works with graphic intensive applications, a seamless solution to connect to 4K or 5K high resolution displays is necessary as Thunderbolt 3 becomes the industry-standard for HD videos and graphics. StarTech.com's new Thunderbolt 3 to DisplayPort adapter (SKU: TB32DP2T) provides the unique feature of connecting to a single 5K display or dual-4K displays via DisplayPort cables. An HDMI version of the adapter (SKU: TB32HD4K60) will also be available, providing dual-4K output to HDMI specific monitors. These adapters provide astonishing resolutions for the most graphic demanding applications, all while maintaining a powerful and smooth video performance". You can see the devices above, including the ports on the docks. These products should work well with both macOS and Windows 10. If you aren't sure why you need a dock or display adapter, imagine this -- owning a laptop or tablet for mobility, but then also connecting a big monitor for desk-use at home. The docks will even let you connect things like Ethernet and legacy USB devices. One wire from your computer to the dock can connect everything in a neat way -- wired mouse and keyboard, USB hard drive, wired internet, monitor, and more. Depending on the model, it can charge your computer too! Sadly, pricing and availability for the Thunderbolt 3 products are not yet known. All we know for now is that they will be released at some point in 2017. More information should be made available soon, so keep checking reputable sites like Amazon.